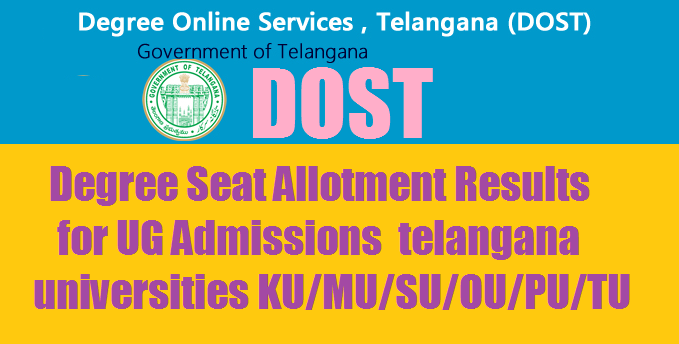 TS DOST Degree Online 1st Phase Seat Allotment Results for UG Admisssions 2017 telangana universities KU/MU/SU/OU/PU/TU Telangana DOST Online Degree Admissions 1st Phase Seat Allotment Results @dost.cgg.gov.in. Degree Online Services Telangana (DOST) Admissions 2017-18 official website dost.cgg.gov.in , TS DOST UG/DEGREE ADMISSIONS 2017 for telangana universities KU/MU/SU/OU/PU/TU ,Telangana Degree Admissions 2017-2018 ,The Telangana State Council of Higher Education (TSCHE) has released the allotment results for the Degree Online Services of Telangana (DOST) on 14-06-2017. Candidates who have applied for the same can check their result from the Council’s official website. The first DOST seat allotment 2017 for Degree Online Services of Telangana (DOST) 2017-18 has been released on June 14. With the TS degree allotment results out now, the admission process has finally begun. The candidates may visit dost.cgg.gov.in official website to download their DOST allotment letter and to know more about admission formalities. The official website www.dost.cgg.gov.in 2017-18 is displaying a notice now that DOST web allotment has been published and candidate can check their result status after login with their details. Degree Online Services, Telangana (DOST) welcomes you to take online admissions for undergraduate courses through this online service for the academic year 2017-18. Telangana State Council of Higher Education is regulating online degree admissions for the academic session 2017-18. Prof. K Venkata Chalam, TSCHE Vice Chairman-I was appointed as the convener of DOST for executing the seat allotment process in degree courses offered in all government colleges, autonomous colleges, private colleges and aided colleges in Telangana. DOST seat allotment result will be published online and the students will also be informed about it through SMS on their registered mobile number. The students will have to take the printout of the allotment letter from DOST website. Those who gain the allotment will be eligible for undergraduate courses at various colleges affiliated with Osmania University, Kakatiya University, Telangana University Mahatma Gandhi University, Satavahana University and Palamuru University for the academic session of 2017-18. These candidates will need to report to the college from June 15 to 20, 2017. Candidates who have not gained allotment in the first list can wait for the second and final lists which will be released on June 28 and July 13. Classwork for the first semester will begin from June 21, 2017. The Council has announced that the first allotment list will be released in the evening. 2. Login to the site. 3. Click on the link for the first allotment list to check your admission status. 4. Keep a copy of the information for further reference. 1.Candidates who are interested in applying for Telangana Degree Admissions Online Application Form 2017 through the official website. 2.Candidates first fill the online application on or before the last date. Candidates have to pay Rs.100 for admission in each university separately. 3.All students who applied under special category ie., NCC, NSS, Sports,CAP should get their certificates verified at helpline centers of the respective Universities. Telangana Students seeking for admission into 1st year of B.A./B.Sc./B.Com. (Gen/ Computers/ Comp.Appln. )/ B.Com. (Voc)/ BSW / BBA / BBM/ BCA Degree courses Must have passed the Two years Intermediate Examination conducted by the Board of Intermediate Education, Telangana State. 4.Your recent passport size photo. (Scanned photo not more than 100 Kb.). Tags: TS DOST Admission Online Application Form for BA/B.A,BSc/B.Sc, B.B.A, B.C.A,BCom/B.com(Computers) Courses in Telangana State will be started from May 8th 2017.TS DOST 2017 UG/DEGREE ADMISSIONS for 2017-2018 @www.dost.cgg.gov.in UG Courses @dost.cgg.gov.in, TS Mahatma Gandhi University Degree Online Admission Notification Online Apply,TS Palamur University Degree Online Admission Notification Online Apply,TS Telangana University Degree Online admission Notification Online Apply,TS Kakatiya University Degree Online Admission Notification Online Apply,TS Satavahana University Degree Online Admission Notification Online Apply,TS Osmania University Degree Online Admission Notification Online Apply,TS DOST University.